In Enrique Tomás we know that Jamón is a true pleasure, that's why we transmit this passion through a top product of the gastronomy of our country, the Iberian ham 100% acorn-fed, popularly known as pata negra. Elaborated with pigs of 100% Iberian breed, only present in our peninsula, which have been fed during the Montanera (free-range season) with acorns, herbs and wild plants, this dry cured delicacy has an exceptional flavour, ideal for the most demanding palates. 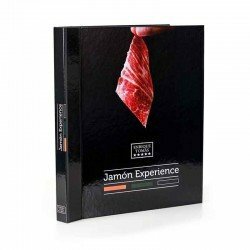 In our store you can buy top quality Jamón Ibérico, choosing from four outstanding sources or orgins: Salamanca, the soft Jamón of Gijuelo or the one from Huelva, with a strong and lasting taste which is also known as Jamón de Jabugo, or the one from Cáceres-Badajoz, very aromatic and the one from Cordoba, more specifically from the Pedroches Valley with an intense and delicious taste. We have all formats available, a whole piece if desired can be sliced by knife and vacuum packed, gift boxes and other special packs containing 3 kilos of a sliced whole piece to enjoy it comfortably at home. Our Jamón Bellota 100% Ibérico is an absolute delight for the palate. These pigs of 100% Iberian breed reared freely in the meadows during the Montanera season, have been fed with acorns, wild plants and grasses. Thus, the final product of this animal could not be other than a meat with an exceptional flavour thanks to the infiltration of fat in the muscle, as well as the feeding and care that these appreciated animals have received. The Jamón Bellota 100% Ibérico is characterised by being juicy, with infiltrated fat and tasting differently, depending on the origin and the dry curing process. 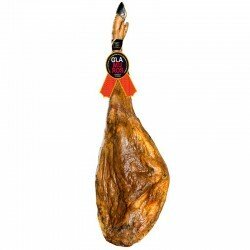 The Jamón 100% Iberico Bellota is the best ham in the world, a unique product of which we are very proud in Enrique Tomás. Elaborated from the hind leg of 100% Iberian breed pigs selected with the strictest processes, after 36 months of dry curing you can taste a product of perfect flavour, which depending on the area of origin, will have nuances that will easily identify each region. Salamanca: mostly from Guijuelo, it is pleasant on the palate, a delight! Huelva: also called Jabugo because of the area where they are made, have a strong taste that lasts long in the mouth. Ideal for those who love intense flavours. Cáceres-Badajoz: they represent the area of Extremadura. It is full of aromas. Córdoba: from the Pedroches Valley, this product is intense and very rich. Choose among our all our formats: whole piece, knife-sliced jamón and vacuum packed, our exceptional boxes or packs with the whole piece perfectly sliced so you just have to open it and enjoy it. The best Jamón in the world straight to your palate!